That’s some praise indeed for the man who was forbidden, from an early age, to create images that could be worshipped as idols. 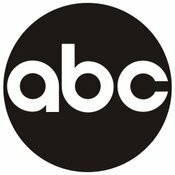 Taking this into consideration Rand’s career of creating corporate icons for the likes of IBM, ABC and UPS seems highly unlikely. But that is exactly where he ended up – have you ever seen the eye – bee –m logo he created? 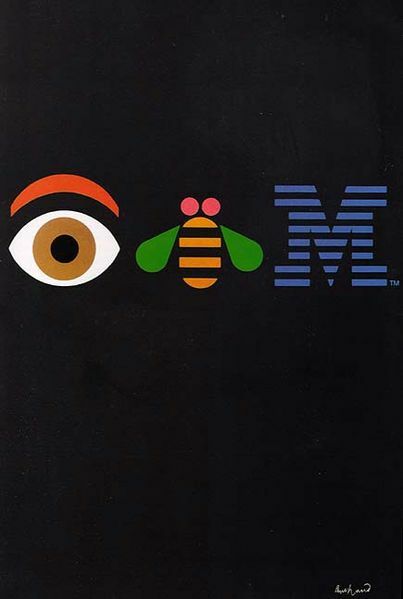 The identity he created for IBM was, without a doubt, his defining corporate identity. It became not so much a piece of design but a basic design philosophy that permeated corporate consciousness and public awareness. 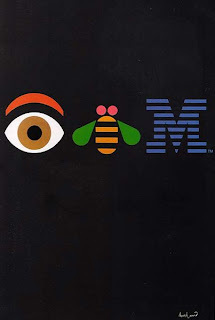 Rand developed the IBM logo over three decades and the latest version is still in use today – as is several of his over corporate designs for ABC, Cummins Engine, and Westinghouse. Even UPS only changed their original Rand identity recently (controversially). The core ideology that drove Rand’s career, and his lasting influence, was the modernist philosophy he so admired. He celebrated the works of artists from Paul Cézanne to Jan Tschichold, and constantly attempted to draw the connections between their creative output and significant applications in graphic design. Rand believed so strongly in the modernist ideal that during his later career he became increasingly agitated by the rise of postmodernism. This came to ahead when, in 1992, he resigned from a position he held at Yale in protest at the appointment of postmodern and feminist designer Sheila Levrant de Bretteville. He then encouraged his colleague, Armin Hofmann to do the same. Paul Rand will always be known for his modernist approach to design and the major impact he had on making the design profession reputable.